The Civil Rights Movement of the 1950s and 1960s was highly controversial in many black churches, where the minister preached spiritual salvation rather than political activism. The National Baptist Convention became deeply split; J.H. Jackson, President of the National Baptist Convention, had supported the Montgomery bus boycott of 1956, but by 1960 he told his denomination they should not become involved in civil rights activism. Jackson’s vocal stance for “civil rights through law and order” went in direct opposition to the methods of civil disobedience advocated by King. A group led by Gardner C. Taylor including Martin Luther King, Sr and Jr.; Ralph DavidAbernathy Sr., Benjamin Mays, and L. Venchael Booth (a Cincinnati, Ohio pastor) filed suit against Jackson, accusing him of violating the denomination’s constitution. They accused him of ignoring the four-term limitation of NBC president as stated in the constitution. The court decided in Jackson’s favor and at the annual convention meeting in Philadelphia in 1960, Jackson was installed to a fifth term as president. In response to Jackson’s reelection, Taylor’s group demanded a roll call, but instead the meeting was adjourned. The dispute was once again taken to court, and the court again sided with Jackson. He remained as president of the convention. The events of the next annual meeting in Kansas City, Missouri were among the most memorable in the organization’s history. During that meeting Taylor’s group attempted to secure control of the podium to compel a head count for the organization’s presidency but Jackson’s group blocked access to the podium furthering the conflict between the two groups. In the course of the misunderstanding Rev. A. G. Wright of Detroit fell four feet from the stage to the auditorium floor, resulting in a concussion that caused him to lose his life days later. The proceedings returned to order only after the Mayor of Kansas City, H. Roe Bartle, appealed to the clergymen to cease fighting. Following the meeting, Jackson pointedly denounced the nonviolent civil rights movement, including the Student Nonviolent Coordinating Committee and the Congress of Racial Equality. He also removed Martin Luther King Jr. from the vice-presidency of the Baptist Training Union and Sunday School Congress. In response, Taylor and his group met together in 1961 at Zion Baptist Church in Cincinnati, where they organized the Progressive National Baptist Convention. About half a million NBC members ended up leaving the NBC for the new group. 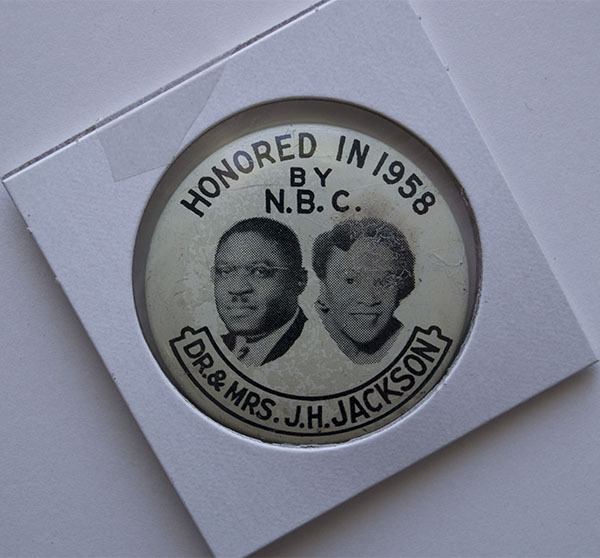 Jackson continued as president of the NBC until September 1982, when he was unseated by the long-serving General Secretary of the Convention, T.J. Jemison, the son of Jackson’s predecessor.